Maine Guides provide a unique perspective gained through experience! Registered Maine Guides are outdoor professionals who are licensed and permitted to accept any form of remuneration for their services in accompanying or assisting any person in the fields, forests or on the waters or ice within the jurisdiction of the State while hunting, fishing, trapping, boating, snowmobiling, using and all-terrain vehicle or camping at a primitive camping area. 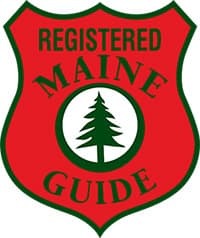 Licensing for Registered Maine Guides first began 1897. During that first year, 1700 individuals became licensed, primarily in the hunting and fishing disciplines. Over the years, canoe trips gained popularity as well. For many years, a Maine Guide was not required to submit to any standardized testing. Interested parties simply had to pass muster with the local game warden. If the game warden considered them qualified and fit to guide in the outdoors, they were licensed as a Registered Maine Guide. In 1975, a standardized test and procedure was established for licensing. There are currently approximately 6,300 licensed guides in Maine. Guides can be licensed in one or more specialized classifications. Specialized Recreational classification means that a person has met the qualifications to guide watercraft, all-terrain vehicles, snowmobiling and camping activities. This classification also qualifies a person to guide watercraft including paddlesports on inland waters as defined in DIFW Rule 24.02 E.
Specialized Sea-Kayaking classification means that a person has met the qualifications to guide sea-kayaking activities to include paddlesports on the State's territorial seas and tributaries of the State up to the head of tide and out to the three-mile limit. This classification includes overnight camping trips in conjunction with those sea-kayaking and paddlesports. A person wishing to guide paddlesports on the ocean as defined within this section must have a current Specialized Sea-Kayaking classification. Specialized Tide-Water Fishing classification means that a person has met the qualifications to guide sport fishing activities on the State's territorial seas and tributaries of the State up to the head of tide out to the three-mile limit, including overnight camping trips in conjunction with those tide-water fishing activities. This license shall apply to any person engaged in guiding fishing activity for any species of fish, except those species harvested under the authority of a Department of Marine Resources license. This rule does not apply to activity occurring on board a vessel holding a valid and current certificate of inspection issued by the United States Coast Guard. b. A minimum of five years' professional experience in the specialized classification(s) must be documented within that ten-year period. One year of professional experience shall be credited for every 240 hours worked in a calendar year. There must be a minimum of eighty hours of time spent guiding in a calendar year for that time to be creditable towards professional experience. Only actual time guiding will be credited. A description of guide's specific duties and responsibilities and amount of the time spent guiding must be included with the affidavit. The applicant may estimate the amount of time devoted specifically to guiding activity. Experience shall be credited on an hour-for-hour basis. b. A determination, at any time, that any of the information contained in the affidavit is false shall be grounds for revocation of the Master Guide certification. Passes a criminal background check. Law abiding citizen with no arrests for committing a crime related to: Human injury, gun laws or major hunting or fishing violations for 20 years. Volunteer community service. Providing education about safety and survival in the Maine woods. Introducing and educating youth about the importance of the ecosystem found in the State of Maine. Active on boards or committees that enhances and promotes the importance of Maine's outdoor resources, ie: youth programs, scout leader, conservation education, safety instructor, search and rescue volunteer, active in Fish and Game club(s), guide license examiner, etc. All nominations must be received by January 10 of the calendar year. All nominations will be reviewed by a seven (7) member review panel from the MDIFW. The Award will be presented to the winner at the Annual Maine Professional Guides Banquet each year.